Agile is a software development methodology that helps teams respond to unpredictability through small, continuous, and controllable business experiments. As customers buy more digital products at increasing speeds, software companies need to quickly adjust their products to a changing landscape in order to stay competitive. Product and development teams need systems that react quickly to improvements and progress in their target markets. That’s the value proposition that agile promises: it helps teams release features that are intuitive, perform well, and meet customers’ evolving needs. Teams build software that’s up to date with market standards, rather than outdated by several months. The biggest, most important end-goal of agile is adaptability. As companies grow larger, however, this goal becomes harder and harder to achieve. There are more teams to mobilize and more communication to manage. The risk? More confusion can happen as a result. That’s where the idea of ‘scaled agile’ enters the picture. Large companies need a thoughtful, impactful, and streamlined way to encourage agile adoption across teams and people. In a recent survey from ThoughtWorks, 61 percent of respondents reported that one of their greatest company challenges was adapting to new changes in the industry. There are many flavors for doing agile at scale, as well as consultants, certifications, and tools to help scale agile at your organization. Many of these fall into the category of ‘top-down,’ meaning that frameworks, tools, and processes are designed and deployed from management levels, down. There’s a point person who oversees direction and deployment across the entire organization. Everything is centralized. The top-down approach is convenient, understandable, and well-established as a traditional methodology. In some cases, it’s all that an organization needs: if an organization’s goals are to streamline delivery and releases to every fixed number of months, ‘top-down’ is a strong potential fit. It’s a cookie-cutter framework that is well-understood and confirmative to traditional management layers. The flip side of this approach, however, is that it requires organizations to make a significant financial investment in employee education, process implementation, and support. But top-down agile often falls short in responding to evolving business environments and changes across multiple teams, platforms, and geographies. It can actually make your teams less adaptable and create organization-wide bottlenecks as a result. This approach also requires that organizations make a significant financial and process investment in bringing teams to the same level. In practice, there is distance between the C-level executives and managers driving top-down organization, and the practitioners actually doing the work. The ground-level looks very different from the top, and practitioners are often better-positioned to know what they need. Enter the ‘bottom-up’ approach for scaling agile. Teams self-organize using their own flavor of agile and figure out systems for program-level management that accounts for heterogeneous team structures. Cross-functional groups operate with complete autonomy and work out their own goals, processes, and milestones. With a bottom-up approach, individual teams, business units or products can deliver more value than before. The idea is simple. If teams can fully customize agile to their work styles, they’ll be more likely to adhere to them, which makes the process of scaling more streamlined. It tackles an important pain point: when managers tell teams to work in a certain way, inefficiencies may arise, and teams may feel more likely to ditch the methodology altogether. Bottom-up agile allows teams to work in a way that suits them best. The result? Agile scales seamlessly, in a way that is the antithesis of a ‘one size fits all’ approach. Make sure that you have the right tools. Program managers should make sure that collaboration tools are in place, at the appropriate layers. Leave communication and knowledge-sharing to the groups and individual team members, themselves. Give them the infrastructure that they need to succeed. Revisit technical practices. Make sure that all code is clean so that different parts of the organization can follow one each other’s work. Create small networks. Find ways to bring teams together, and encourage collaboration between groups, on a micro-level. Find low-touch ways to communicate—with a mailing list, for instance. Become feedback-oriented. Agile teams will need to create the right feedback loops between one another. And the most important one? That comes from your customers. “Building the right feedback loops will help you to understand your environment,” explains software developer Rouan Wilsenach on the ThoughtWorks blog. This approach will help you do more than just scale your systems: it will help you scale value delivery. Autonomy is the heart of scaled agile. But project managers still need to make sure they’re communicating across the entire organization—not just amongst themselves. It’s important to share progress updates and project milestones cross-functionally. Organizations don’t just change. Unless groups build and reinforce their feedback loops, teams can become siloed, with company goals becoming lost within individual goals. It’s important to prioritize both concurrently. By making small, continuous improvements, development teams can optimize their decision-making processes. In a larger organization, success must come from all development teams working in concert. 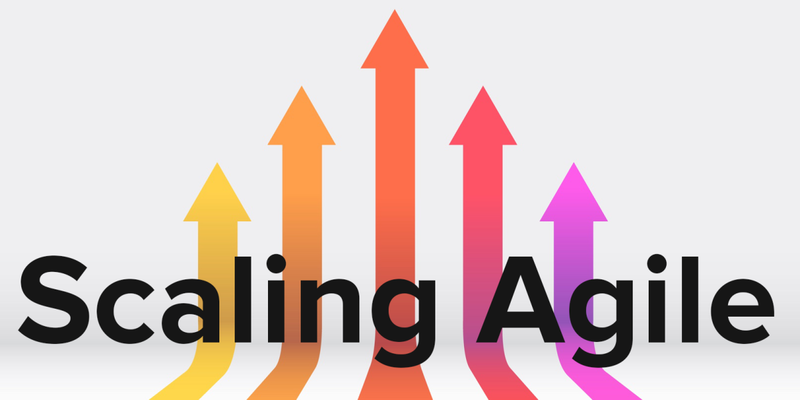 Scaling agile from bottom-up, as opposed to top-down, allows you to capture the value of agile at scale while achieving the flexibility and responsiveness of the framework’s core philosophy. But the reality is that each organization will need its own unique approach and mix of scaled agile flavors. Test, get feedback, refine your processes, and grow. This approach will help ensure that you’re using the best methodologies for your company and team. This post was brought to you by Mingle.